The screech of the wheels of our Boeing 777 finally meeting the ground wake us up. I have pins and needles in my sore heavy legs, and even if the sun stands high and bright at 7 a.m., all I think of is to find a bed to lie on for at least two days. Why didn’t we use our miles to upgrade to business class on such a long trip? What were we thinking? We eventually forget to count the hours needed to arrive in Auckland. With bags under our eyes and our feet swollen from sitting for too many hours, we are no longer sure whether we are hungry, thirsty, tired, or the three together. I wonder if it shows that we are exhausted. Thank God for Melatonin which we take as advised by our friend S. who uses it regularly, he tells us, while traveling long distances. It really helps and we even manage to sleep — crooked no less — during the twelve plus hour flight between San Francisco and Auckland. C’est mieux que rien, better than nothing. “Two years in Wellington,” I reply with a smile. I am so happy to be back indeed. For once, the line at the customs is really short, putting us ahead of schedule for our next connection. We hop on an earlier flight to Queenstown, a jewel located south of New Zealand’s south island. There are not many countries I visit where I feel as if I am going home. There is France of course, and then there is New Zealand. So far. Each time I come back, the excitement is the same. Perhaps it has to do with the nostalgia I feel when memories of good and hard times come to my mind. This time of my life has made a difference. I left New Zealand nine years ago. I find it amazing to notice how the place has changed as well as how much the same it is. When I arrived in January 1997, friends told me that if I had come ten years before, I would not have survived here. “Why is that?” I had to ask them, really puzzled. “The food,” they invariably responded as they quickly noticed my obsession with it. 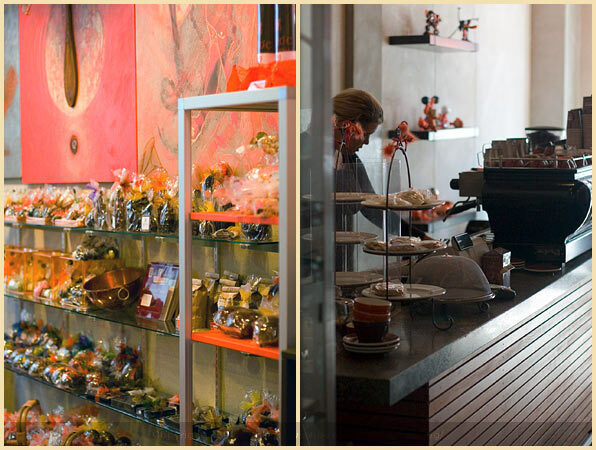 “Not many cafés to be found anywhere around!” But the last twenty to thirty years have witnessed an explosion of new creative food, with a large Asian-Pacific flair, and I do not think that it is going to be over anytime soon. On the contrary. Every time we come back, there seems to be more new cafés and restaurants everywhere. 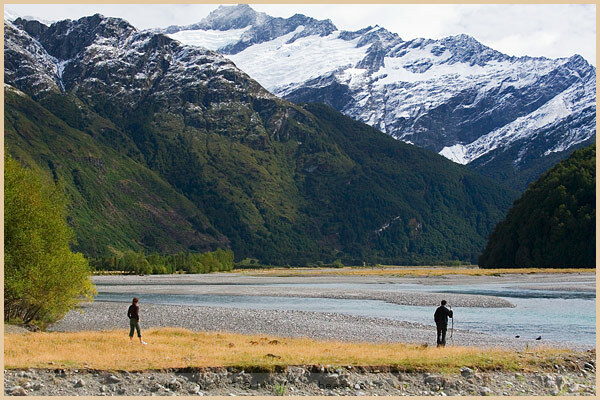 Without stopping in the north island where we travel in February of last year, we plan to spend most of our vacation in the magnificent south island. Nine years before, when my parents visited me in Wellington, together we traveled to the south island, driving from Nelson — at the north of the island — down to Queenstown. Within only one day, it was possible to go from the rugged west seacoast to Alpine glaciers, continuing on through lunar-looking landscapes before reaching the rain forest again. We have come here once more, eager to pursue the dream of the south island. 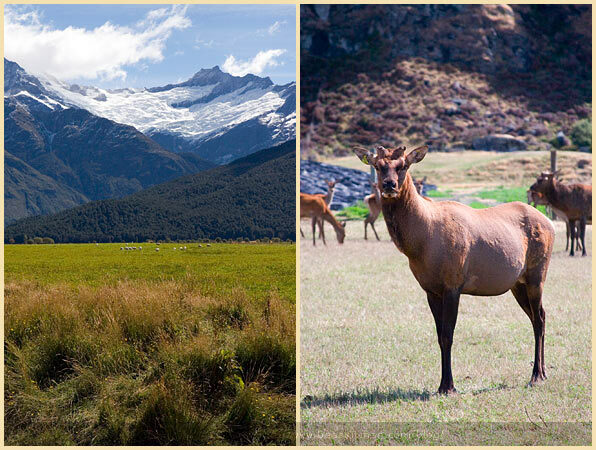 “People in the south island are real New Zealanders, not like people of the north,” Kiwi friends dare to tell me. How funny to hear such a thing! Does every country really have this same north and south disagreement, each respectively thinking they are better? In fact, are they really two different peoples? Out of a population of four millions, one million New Zealanders live in the south island when one million lives in the city of Auckland only. In the south, the landscapes are amazingly beautiful, so much so that even a word like beautiful does not make it justice. Queenstown, the biggest town in Central Otago, sees the start of our journey. We plan to spend two days in the area before heading off to the west later in the week. Walking the small streets of this touristic town brings back fond memories, even if faint. I am glad to see the place in this season. The previous time was winter. On the day we arrive, there is a farmer’s market held by the skyline Gondola — like every Saturday — but I am so jet-lagged than I regrettably only remember the following day. The air is crisp and fresh, the sun bright. As we wait for our hotel room to be ready, we kill time by walking to the lake and have a bite to eat, sitting on the stone beach. Some courageous swimmers having a morning dip remind us that, oh yes, it is still summer here. “Let’s have a quick walk before dinner,” P. suggests with more energy than I seem to have. On a sunny day, Queenstown shines like a precious stone with sparkling Lake Wakatipu niched at the foot of the majestic snow-capped peaks of the Remarkables. We stop for some groceries on the way back, and for the first time, I taste kiwi berries. 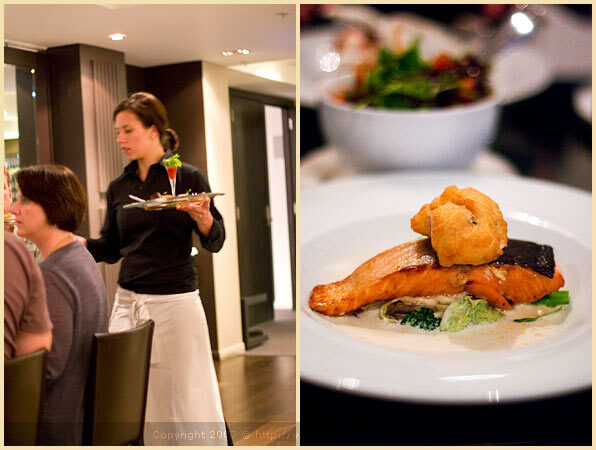 Dinner remains a puzzle, but after a quick look at some promising menus in front of restaurants by our hotel, we eventually choose to dine at Vie, the Sofitel hotel restaurant. Unfortunately, we are unaware that although the restaurant is mostly empty when we arrive, a wedding upstairs is being catered, making our wait long and pretty uncomfortable. Despite this, we enjoy an excellent deliciously presented dinner, with great service. Better be, the following day, we are off to hike Ben Lomond Summit. That night, we sleep for almost twelve hours. Instead of starting the hike from the bottom of the Gondola as most people do, we take it to walk this part too — and at this point, we have no idea what lies ahead of us. We sweat, sigh more and hope that at every new corner opening in front of us, we are going to discern the summit, but it takes us four hours before we reach it. P’s knee hurting does not help either. “Did they decide to draw a straight line and think we just had to follow it to the top?” I mumble with a pinch of sarcasm in my voice. Truth being said, when we finally arrive, we are hungry, thirsty, tired, happy, thrilled but essentially blown away by the view. What a beautiful hike, all the way! Lunch — our usual sandwiches, salad, chips, yogurt and fruit — has not tasted as good in weeks, it seems. We are only a group of about ten people sitting at the top, but each one of our faces expresses the same emotion. Lake Wakatipu looks even more spectacular from here! Making our way down, we stop at the arrival of the Gondola where we watch a few adventurous people bungy-jumping. 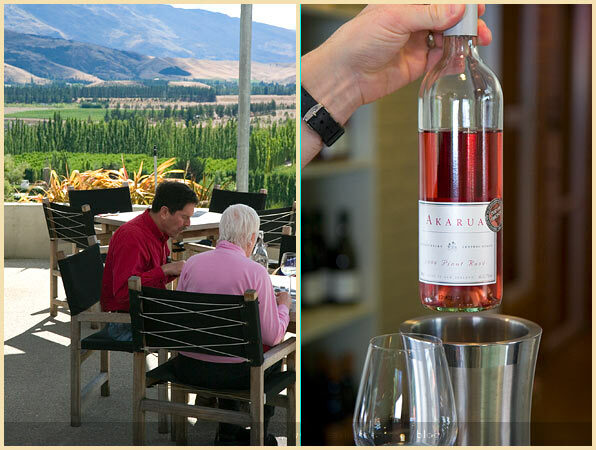 Because this is also one activity that people seek in this resort town, next to hiking, mountain-biking, tramping, jet boating, or visiting the local wineries to sip Pinot Noir. 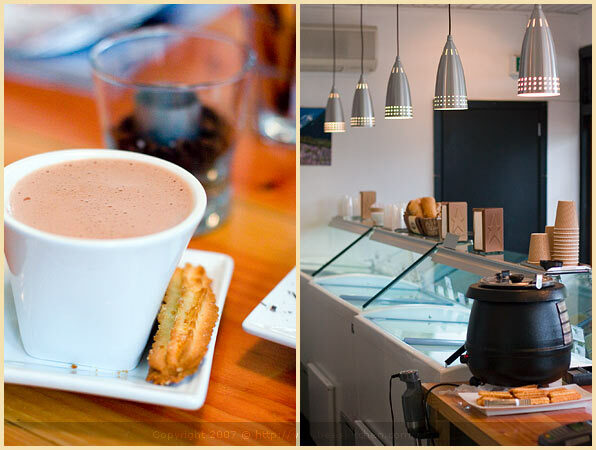 One more day in town allows for a stop at Patagonia Chocolates’ where we sample ginger-flavored hot chocolate and sweet nibbles, and a lunch at Vudu Café where we meet our friends S. and K. freshly arrived from Wellington. They are continuing the journey with us. Would we return? In a heartbeat, although further south, we soon discover a sister town, quieter and as pretty. If not better. The car full to the roof with our bags, we jump in, ready for our next stop. 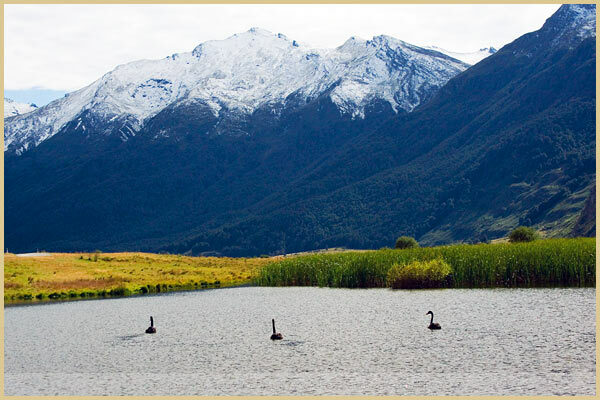 It should only take us two hours to arrive in Te Anau where we plan to visit Milford Sound. Before heading in that direction, I suggest that we take the forty-kilometer scenic drive to Glenorchy located further north. Visually, this small town has nothing to offer. Dead. The enchantment? Its surroundings with, once more, a beautiful lake sitting at the edge of majestic mountains. Do you remember Peter Jackson’s Lord of the Rings trilogy? Some of the scenes shot in this area does not come as a surprise, the place is magical. And a few hours later, we arrive in Te Anau. 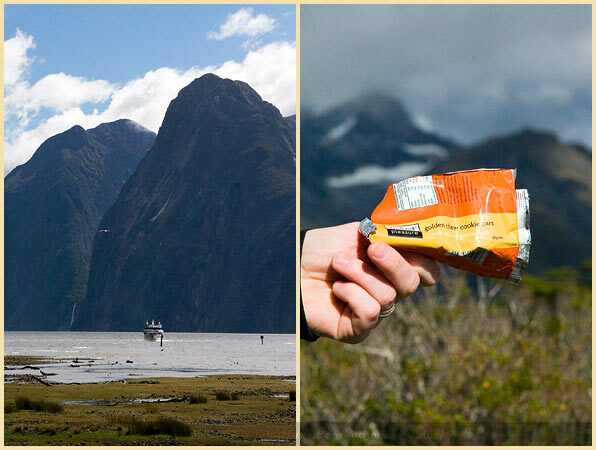 This small town on the west coast serves as a basis for anyone eager to visit Milford Sound. Rudyard Kipling called it the eight wonder of the world. 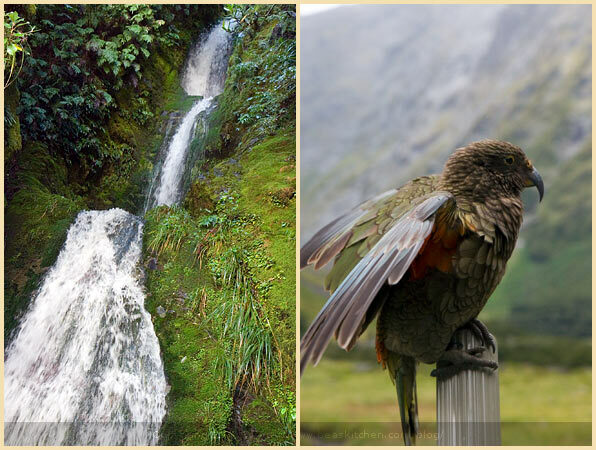 Part of the Fiordland National Park, this area of New Zealand is also one of the wettest part of the country. We dread it. “Do you all have a raincoat?” Stef. asks in a cheerful tone. She is our eco guide for our day exploring and cruising the Sound. “I am 99% sure that we will get snow too.” We are eight lucky people in a small van. Not only does it neither rain nor snow, but we even manage to hike the first day of the Routeburn Track under a bright sun. “I guess the rain will come tomorrow then,” Stef. adds laughing. “We are lucky!” When we stop at Mirror Lakes on the way, I am in awe. The sunbeams mingled with the low clouds hanging at the bottom of the mountains give the sky a dramatic mystical flair, like the vision of a forbidden place. Our cruise boat is small. “It is a boat made for the sea,” Stef. tells us before we board. “You will get closer to the waterfalls than other cruise boats.“. 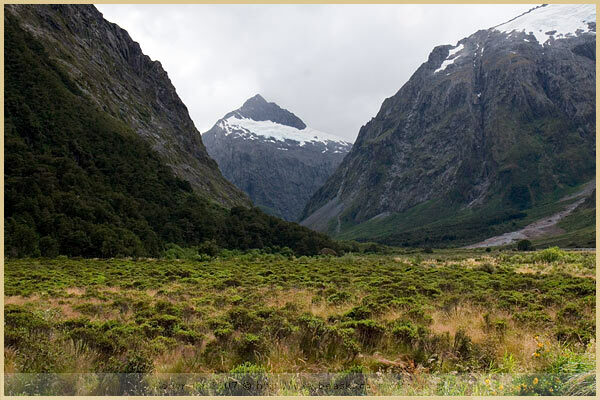 We cruise the full length of breathtaking Milford Sound to the Tasman Sea. Because it has rained a lot the previous days, the waterfalls are gushy. That night, we follow the advice of the lady with a pointy nose running our motel, and have dinner at La Dolce Vita. “It is my favorite,” she adds enthusiastically when we ask for more details. A man with a strong Italian accent greets us when we arrive at the restaurant, still half empty by 7 p.m. Are we becoming early birds? Hungry and tired for sure. A quick glance at the menu has me decided quickly. I will finally fulfill my long overdue craving for Greenlip Mussels. I cannot remember the last time I ate some. 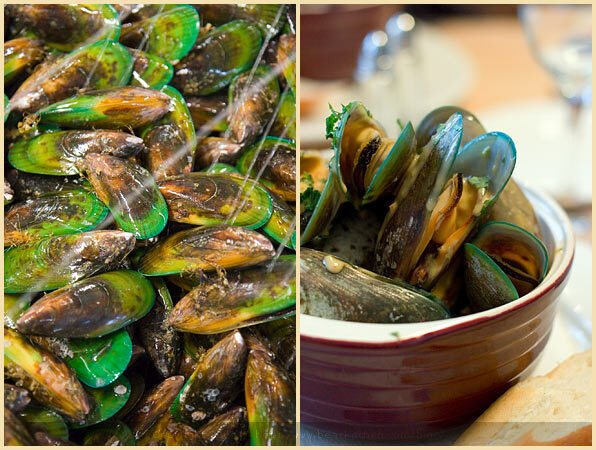 We do not think much about the place actually, but enjoy the mussels and wine all the same. “Let’s hope the weather is better in Wanaka,” P. tells me as we pull the car off the driveway. From Queenstown, Wanaka is two hours by car. On the way, it snows. I am dreadfully thinking about the clothes I have brought with me, thinking I am going to be frozen if the weather does not change. “I think I will need to go shopping,” I say while hopping back in the car after a quick picture stop. “Oui, c’est cela! Toutes les excuses sont bonnes ! ” P. responds with a gentle grin. 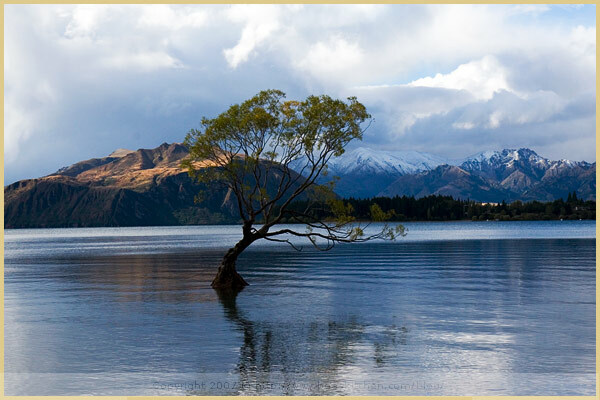 Coming down the hill into the town, we cannot refrain a spontaneous “Wow” when we get to the shores of Lake Wanaka. “Is it everywhere like this?” The scenery is spectacular. This recent snow definitely adds a touch to the landscape, providing a breathtaking contrast to the more verdant range of mountains and the shimmering water of the lake. The town of Wanaka is smaller than its neighboring sister Queenstown, but somehow quieter and gentler too. 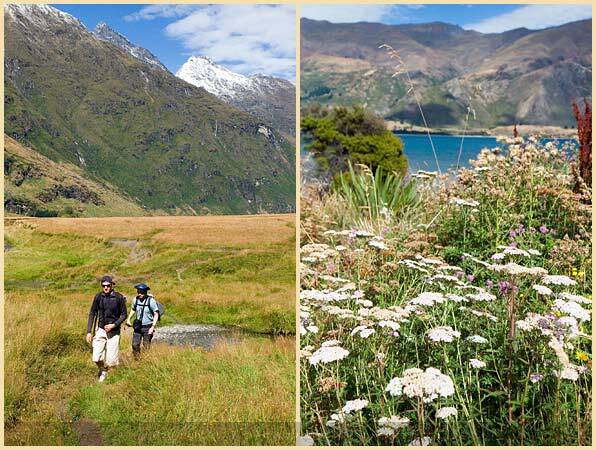 Our plan is to spend four days hiking in Mt Aspiring National Park nearby and visit a few wineries, stopping in the historic town of Clyde, Cardrona and the gold mining settlement of Arrowtown on the way. 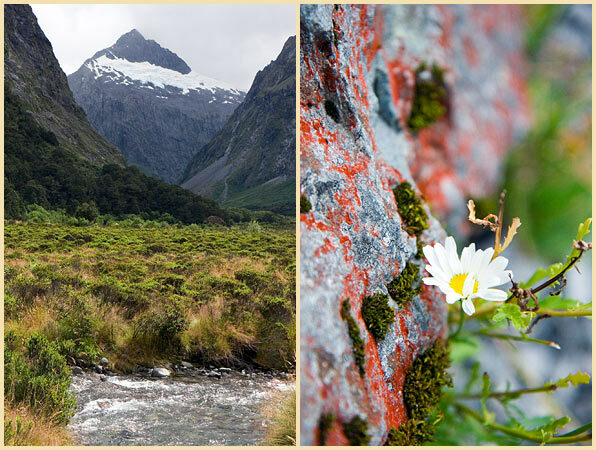 Mt Aspiring National Park gives us the feeling we could be in the French Alps, Switzerland, or perhaps traveling to Patagonia in Argentina. The park is a dreamland of alpine lakes peaks with river valleys, mountains and glaciers. 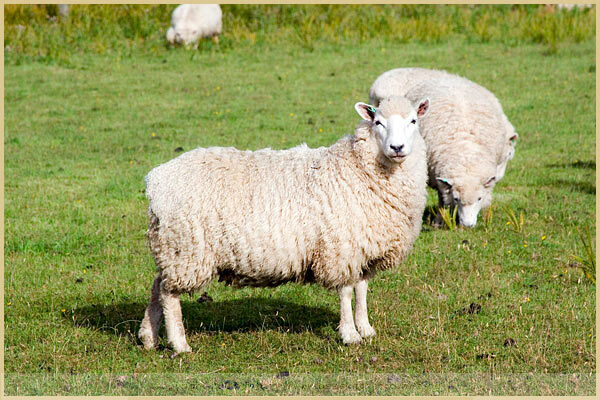 One day, we decide to have a gentle walk following the bed of a river where fluffy sheep graze nearby. I try to follow their trail but they are so camera shy that it becomes a challenge and a game to chase them around to steal at least one decent picture. 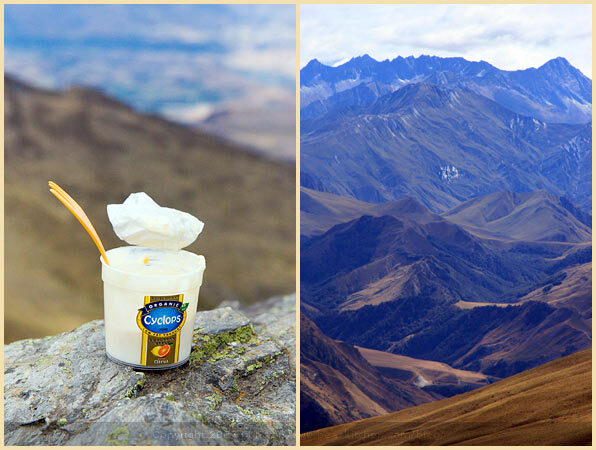 We only have time for a tiny taste of the entire park but promise to come back for a longer alpine hike, later. 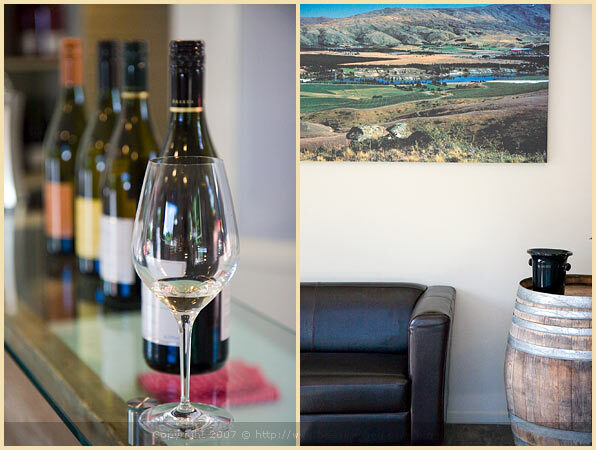 At a latitude of 45 degrees south, Central Otago stands as the most southerly wine making region in the world. 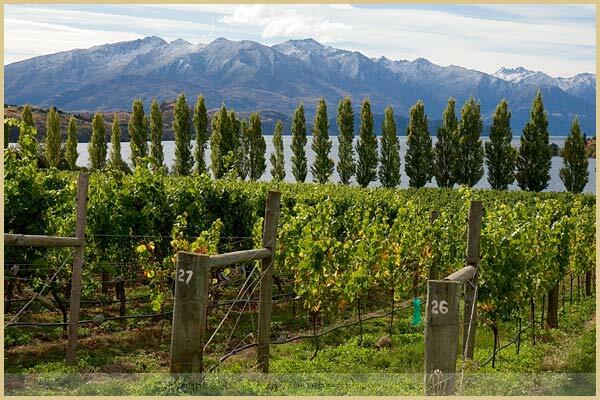 The vineyards, planted on the steep slopes of lake sides in the middle of a spectacular alpine scenery, are New Zealand’s highest, at 200 to 450 meters above sea level. 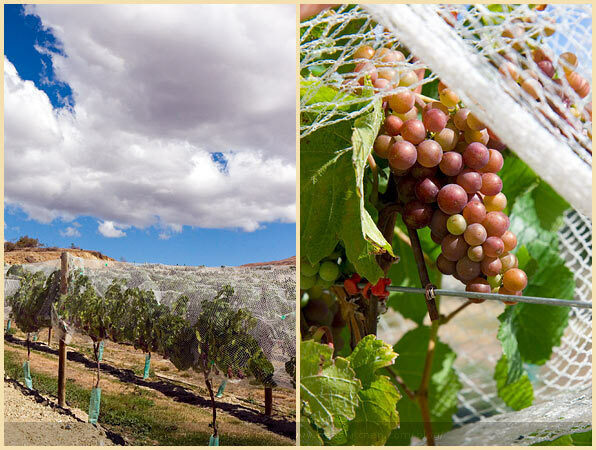 Quickly, this developing wine growing region reaches an international reputation for its Pinot Noir production — 70% of the total vineyard plantings in 2002. Akarua winery sees the beginning of our wine quest. We are welcomed by a friendly hostess who explains the history of the region and its wines. Between the Rosé and a few different Pinot Noir she has us taste, we surprisingly have a hard time to make our mind. The Rosé has an unexpected sweeter touch we like, so much so that we leave with a few bottles. Hungry, we drive further along to Mt Difficulty winery where we have booked a table for lunch. With the scorching sun and violent gusts of wind outside, we wonder all of the sudden whether we have not arrived in the middle of a desert. The yellow-colored stone of the hills indicate that the weather must be dry, and we eventually wonder how they manage to grow wines here. But their wines are amongst the region’s best. “Look at these plums,” S. cries out when she looks out of the kitchen window. “Quick, let’s get some before they see us.” I grab a plate that I hide under my shirt, and we sneak out. “They would not mind anyway,” I tell her while we pick them. “They are falling on the ground!” Remembering it is S’s birthday the following day, I am also sure that although quite comfortable, our self-contained accommodation is not equipped for much baking. “What would you say about a clafoutis?” I ask her when we walk back in. Her eyes sparkle and I know the answer. We leave Wanaka with regret, but happy to have found a new spot to come back to. Our list of things to do is already long for next time, but it is time to move on to our next stop. When our small plane hits turbulence, I think that my stomach and I are not going to survive it. And, by looking at the queasy faces around me, I know that I am not alone to feel this way. How could I have forgotten about the gusty wind around here? We are glad to arrive safely in the capital but pilots flying here are used to it. I don’t think I will ever be. Our two week in New Zealand ends in Wellington. We plan to meet up with numerous friends, do our laundry, relax, stock up on local things to bring back and wander familiar streets where I used to live, nine years before. With one of my best friends recently moved to Wellington from Paris — for the second time — we have a lot to catch up on. We think it will rain but the weather clears up quickly. I love Wellington with this sun, and light. For a second, I feel a pinch in my heart, and think how nice it would be to return to stay. 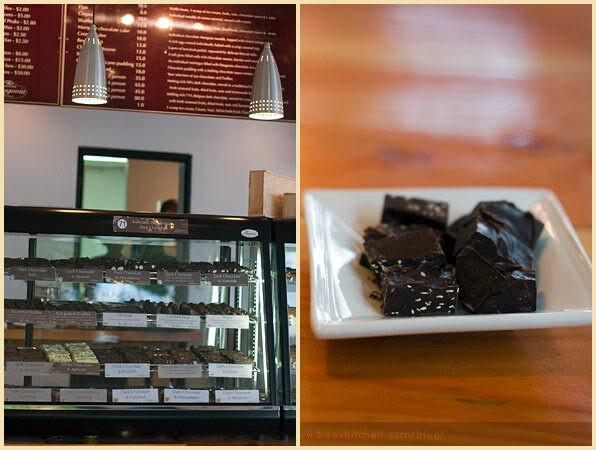 We start with a visit at Schoc Chocolaterie where we stock up on dark-flavored chocolates, with Sweet basil, Sea Salt, Lime Chilli, Cardamom and Earl Grey to name a few. We discovered them the year before. 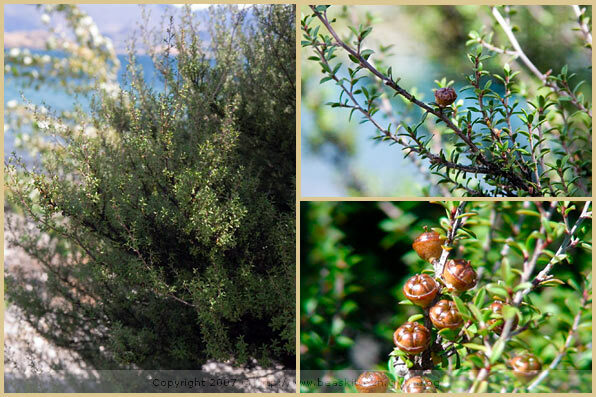 We also buy a few pots of local Manuka Honey, a sacred ingredient here in New Zealand for its health benefits — a superior treatment for wound infections and an immune system stimulant — I have learned over the years. Being back in Wellington feels easy and comfortable. Familiar. With a population of only about 400 000, the capital of New Zealand is where most of the art, culture and political scene happens. Every time we come back, I find it more energetic and vibrant. Every time, I am looking for novelty and never get disappointed. There are always new cafés and restaurants. During our three day stay, we return to Capitol, a favorite restaurant by now, to have lunch with another friend. We also take a walk by the waterfront to enjoy the beach and watch some sailing boats. We dine in, we chat a fair amount and laugh, we prepare for our next stop, Australia — the story of which you already know. We like Wellington. A lot. And like many of the places we visit during this vacation, we feel sad to leave. Even words like incredibly beautiful seem inadequate to describe this country down under. Because the truth is, we really feel an unconditional love for New Zealand. PS: And I am also so sorry not to have been to be able to catch up with a few bloggers while in Australia or New Zealand: Jules from The Stone Soup who is in Sydney, Ellie from Kitchen Wench in Melbourne, Barbara from Winos and Foodies in Auckland, Fanny from Food Beam in Christchurch, Bron from Bron Marshall around Christchurch too. Thank you for your emails! I wish I could have. Next time I hope. I was, however, lucky to spend a short time with Emma from The Laughing Gastronome in Wellington. Thank you Emma for the invite. It was delightful to meet you! Improvised Plum Clafoutis for S.
Wash the plums and remove the pits. Slice them. Butter an oven dish and arrange the plum in it. In a bowl, whip two eggs and then add the sugar. Mix well before sprinkling the flour. Mix and then, add the milk. Pour the preparation over the plums and place a few pieces of butter on top. Cook in the oven for about 45 min. Check regularly and adjust cooking time if necessary. Remove and let cool a little before serving. Clafoutis aux prunes improvisé pour S.
Lavez les prunes et retirez les noyaux. Coupez-les en tranches. Beurrez un petit plat à gratin et disposez les prunes régulièrement. Dans une jatte, battez les deux oeufs et ajoutez le sucre. Mélangez en faisant mousser, puis ajoutez la farine en pluie. Mélangez avec un fouet et enfin, ajoutez le lait. Versez cette préparation sur les prunes et parsemez de noisettes de beurre. Mettez au four pendant environ 45 mns Vérifiez fréquemment et ajustez le temps de cuisson si nécessaire. Retirez du four et servez tiède. thanks to your beautiful & appetizing pictures we love it too! Tu vois, je viens de passer 10 bonnes minutes a rever sur tes photos. Je vais me remettre au boulot la tete pleine de ces paysages magnifiques. merci Bea. Magnifique, merci pour ce reportage qui en l’espace d’un instant m’a transportée dans ce beau rêve ! C’est malin j’ai très envie de prendre l’avion maintenant ! I’ve never been to NZ, but your trip has made me really want to go! Thanks for sharing all those beautiful photos! Good grief, Bea, you make a girl yearn! Absolutely gorgeous. The beautiful pictures make me really wanna go back to New Zealand again! If only I lived there, in Middle Earth… I would be so happy! 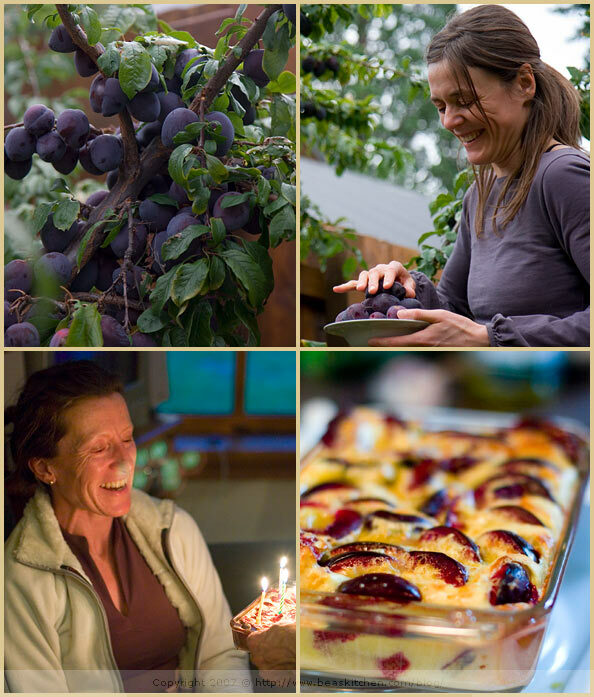 Fantastic trip, fantastic photos & a fantastic clafoutis! 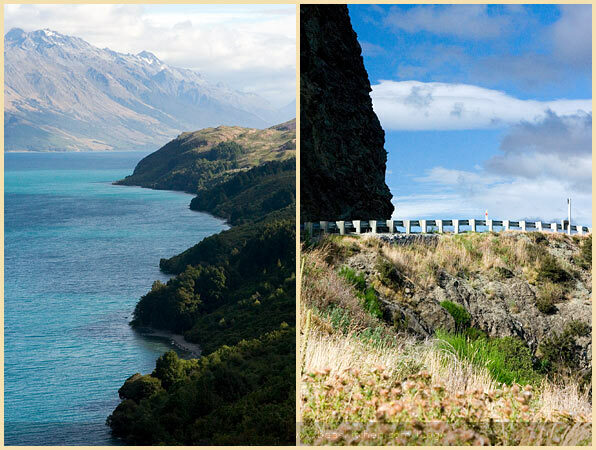 Thanks for sharing these unforgettable moments with us Bea, you make me love New Zealand just by reading your blog! Quel fantastique voyage ! Tout à fait le genre de vacances qui me plaisent. Vous m’avez définitivement donné envie de m’envoler pour la Nouvelle-Zélande. 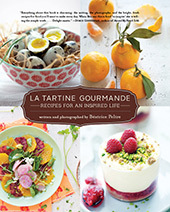 Merci beaucoup pour ce petit guide touristique et gastronomique !!! Vous avez un réel talent de conteuse. I am stunned and absolutely blown away! What a beautiful place, and gorgeous, amazing pictures. merci! Depuis que je lis ton blog, j’ai rapidement compris qu’entre toi et la NZ, c’était une grande histoire d’amour et qu’il te tient à coeur de faire découvrir et aimer ce pays à d’autres ! You’ve inspired me to jump in the car this (long) weekend!! Bea, as a NZ’er living overseas (London) you bring a tear to my eye describing my beautiful country. I love your commentary and photos and reminder of how lucky I am to call this unique place my home. It was lovely to meet you too! And I am glad to know you love our country ; Wellington is a wonderful place to be – I have to agree! I can’t wait to be on holidays (tomorrow 🙂 to visit – I’ve been stuck in the campus for too long now. By the way it’s funny because I was about to post a picture of an “ammanite tue mouche” I took yesterday! Salut bea! je suis une eleve de boston qui ADORE cuisiner. Merci pour un blog magnifique. 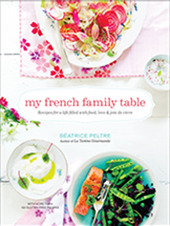 I´l m´inspire toujours! je voulais juste savior ou ce trouve la recette du ¨chocolat promis 2006¨car je trouve pas la recete qui va avec le beau petit coulant de chocolat. Merci! So weird, we’ve lived in and we’re in love with the same cities ! I’m just 9 years late! 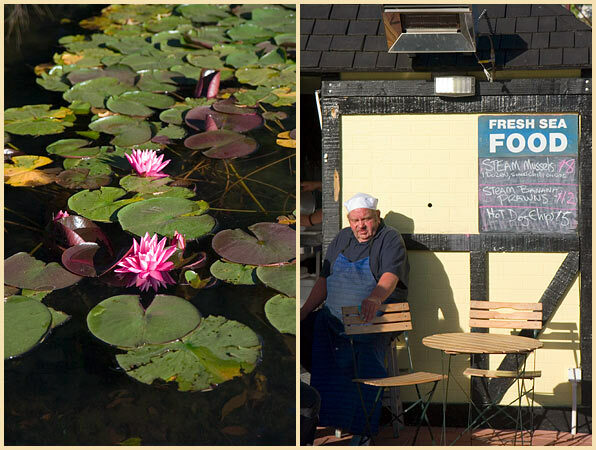 Merci encore pour ces belles photos qui me rendent “homesick” de la NZ. Quel voyage exotique pour nous qui sommes si loin, c’est un pays très tentant et ô combien mis en valeur par tes photos. I always say the same thing, but it’s true, Bea. Your photos are amazing — that red mushroom! The greenlipped mussels! They truly delight the eye. Your blog is such a treat. I have very much enjoyed your beautiful photographs and notes about your trip to New Zealand and Australia. Although I have never been to either country, you make me feel nostalgic and I can’t wait to actually go see them in person one day. Wow, you have just made me miss New Zealand so fiercely with this post. It’s frankly the most beautiful place I have ever been in my life, and I can’t wait until I have the resources to go back. Tu es vraiment très douée pour faire partager tes voyages, un immense bravo et merci! ça fait du bien! your post makes me remember fondly my trip to new zealand last year. especially the town of wanaka. i noticed that one of the pictures from wanaka looks familiar. did you, by any chance, stay in wanaka homestead? i stayed there and i loved it. Eunice, yes yes. We stayed there indeed! Loved it too! Glad to hear you enjoyed your NZ return! Even though it can be cool through Fiordland when it is still ‘officially’ summer, the weather suits the landscape and you’ve really captured that in your stunning photos. I need so little encouragement and am off to Akarua this weekend! I was bug eyed from the first picture on! And the long hike so soon after arrival, just the kind of thing that we do and then wonder what were we thinking. Every picture and story here was wow, it can’t get better but it seemed that it did each day. I want to go more than ever. 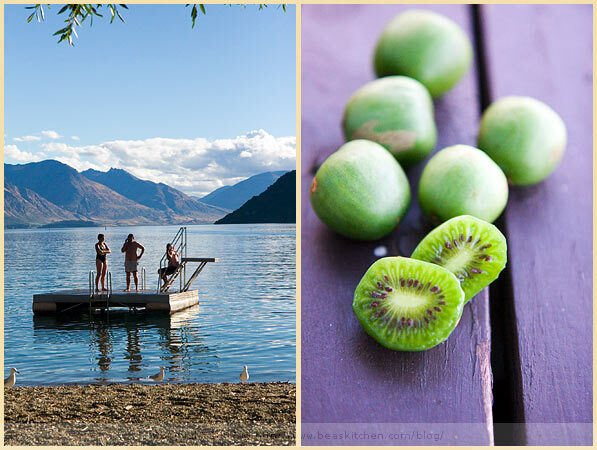 I live in Wanaka – YES its amazing. Your photos are fantastic! Moi aussi ça me donne envie , très fort d’y retouner ! Le petit clin d’oeil avec lafamille , sympa! merci pour le voyage , en cette veille de Pâques ! Mary, ah nice! You are a lucky one! Joyeuses Pâques! Mj, I think you will not be disappointed. Jean, lucky you! Beautiful place indeed. I cannot wait to go back. Bonjour les parents Dourneau! Ravie de vous voir de passage ici. IL est trognon quand même Liam, pas vrai?? these are some seriously beautiful photos. new zealand is so close to australia that i often dismiss as “too familiar” or “too boring” but your photos are so beautiful that i am completely inspired to visit new zealand. so when is your new zealand photographic coffee table book being launched??? je ne connais pas la Nouvelle Zélande mais tes photos nous invitent au voyage ! j’en ai le souffle coupé ! Justement avec mon mari on cherchait une destination pour notre voyage de Noces , je crois que je vais lui montrer tes photos ! This is the first time I have been to your website and I have to say that I am blown away – you are amazingly talented. I lived in Australia for while and spent a lot of time traveling in New Zealand – you captured it just the way I remember! Thank you! Anna, oh yes if you are so close, you MUST visit! Marie-Noelle, merci, contente que cela vous plaise! Sylvie, ah oui, c’est vraiment un pays qui en vaut le détour 😉 Surtout pour un voyage de Noces. Leah, ah this is a real nice compliment, thank you! You have captured the essence of NZ beautifully. 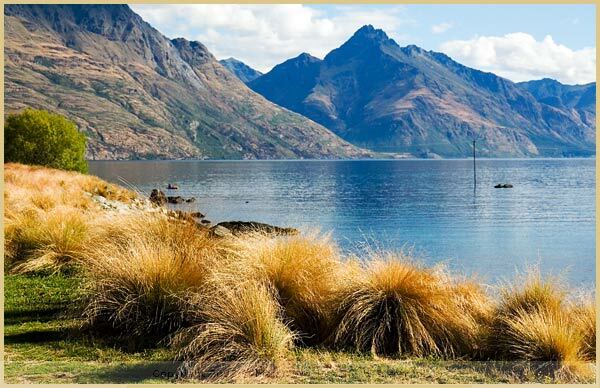 I live very near to Queenstown and i dont think there is anywhere else in the world I would rather be. I have lived here all my life, i have traveled extensively and this is truly “home”. The best site for New Zealand I have seen. As someone who is looking to live in NZ you make me even more determined. My passion in life is the wilderness areas and landscape photography and I think your pics are great. I also am in love with New Zealand. I am a Canadian living in New Caledonia and I fly to New Zealand often. This country is a paradise!! 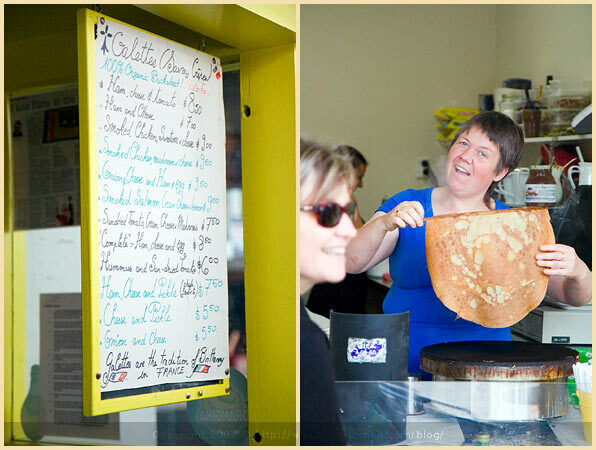 These are some of the best photo’s of New Zealand food I have ever seen. Absolutely beautiful! These photos brought tears to my eyes, having been there myself and greatly desire to return someday soon, perhaps for good. Thank you for sharing your photos and story! Gorgeous pictures and information on one of the most beautiful countries in the world. I have had the pleasure of visiting for a long visit and this only stimulates that longing to return. Beautiful job, thnaks. Salut! Je viens de découvrir votre blog et il est magnifique! Je suis néo-zélandaise (Wellingtonian, born and bred!) mais en ce moment j’habite en France en Haute-Savoie. J’adore la France et comme vous, je me sens “chez moi” en NZ et France aussie. Ce post est vraiment beau et ça me fait pleurir! These photos and your writing are simply beautiful! I traveled around the South Island last fall, and it is by far the most beautiful place I’ve ever experienced. Your photos completely take me back and bring a smile to my face.